Ying couldn't believe what he was hearing. Sinicar was going to take Fortuna, and leave her in the Money Tree. He didn't think anyone could think of something that evil. Actually, he couldn't believe SINICAR had come up with the idea. The guy had less brain cells than the screaming Unmagine at Fortuna's. As he watched Fortuna fail to kick away the potion, and see it slide over her robes, he looked around frantically for something to help him. However, he could only see dirt and the liquid. "This is not good," he thought. "I'll take a look around" answered Yang, and flew the perimeter of the vine walls. When he found nothing, he flew up, higher and higher, looking for some kind of weak spot. Finally, he found one. "There's some kind of crack in one of the roots," he shouted to Destiny. "If I can get a few more flying Neopets up there, we can probably break down the entire place." 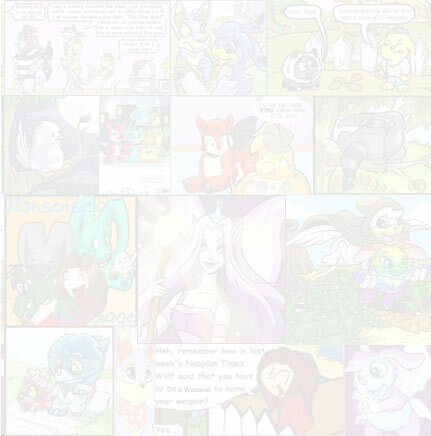 Destiny nodded, and turned to face the other Neopets and owners. "Everyone, please listen. We need Neopets with the ability to fly to help my friend Yang break out of here. The longer we stay, the bigger the chance Sinicar will destroy us." "Who on Neopia is Sinicar?" asked a young Poogle. The white Lupe turned to Yang. "I will have to tell them or they will not help," she told him. Yang nodded. "Okay, but make it quick." "Okay," said a Scorchio finally. "What can we do to help?" "Typical! You can never find a Zaptwig when you really need one," moaned Ying as the potion reached Fortuna's waist, and kept on climbing, no matter how hard the Predictor tried to shake it off. "At this time I'd settle for a plastic butter knife!" Finally he realised he had no choice. He had to go down there and help Fortuna, armed or not armed. "I'm comin' Fortuna!" the red Shoyru cried, and flew into the black cavern. Fortuna looked up from her struggle. "Ying!" she shouted. As Ying neared the wooden wheel, he never noticed the vine slide out from underneath the slime, until it hit him with such force he was knocked unconscious. Fortuna looked in horror as her friend fell into the slime. "Wait! No!" wailed Sinicar, realizing the mistake he had made. Suddenly, Fortuna felt the potion removing itself from her, and slid to the floor, where it started to glow. She was so confused that she didn't feel the vines holding her become loose, and only just stopped herself from falling into the ooze by digging her nails into the wood. Then, in the place where Ying had fallen, something burst out, sending waves of Mind Taker everywhere. But when the red Shoyru turned to face her, she realized her mistake. It may have been Ying's body, but the Mind Taker potion had freed Sinicar into the Shoyru. "So," said Sinicar, stretching his stolen wings. "How do I look? I admit this wasn't my first choice, but it feels even better than I thought it would. Perhaps I can get my brother to make a Shoyru Transmogrification Spell. Well, I've have lives to ruin, goodbye." As Sinicar flew up to the ledge, he turned around to give Fortuna some advice. "Oh, by the way, if you try to follow me, that potion will most certainly switch you and this little Shoyru's mind. And as you can see, he can't even figure out how to talk, let alone raise you to this platform. Not to mention that, in the next hour or so, the potion will evaporate, and all the tunnels I built with the roots will disappear, leaving you trapped in here forever! Have a nice and painful death Fortuna. Hahahahahaha!" As Sinicar flew out of sight, Fortuna realized how helpless the situation was. She wasn't even sure if Ying could hear her, and if Sinicar got out of the tunnels, then she was positive that they would never be able to switch Ying and Sinicar back. "That's it, from now on, I'm never leaving the house without my potions," she muttered. "That's it, just a little more� bingo!" shouted Yang, as a Uni rammed its horn into the crack, making it big enough for some pets to get through. "All right! Now let's get out of here and�" the Shoyru stopped as he heard the rumbling. Suddenly, the walls began to fall down, and everyone one in the cage ducked for cover as the vines crashed down. When the dust settled, Yang looked up just in time to see a red Shoyru fly past the broken tunnels. Sinicar wasn't having much luck with these tunnels. When he had created them, he knew them inside out. But now, they looked exactly the same. It was then he heard the voice. "Ying! I'm so glad I found you. Did you find Fortuna?" Sinicar turned round just in time to see the green missile hurtling towards him. Paralyzed with shock, the missile came flying into him, throwing them against the wall. "Uhh, that's okay�Yang," stuttered Sinicar. "I was uh� just looking for you." A white Lupe walked up to them. "Did you find Fortuna?" it asked worriedly. Anger flashed in Sinicar's Shoyru eyes for just an instant when he recognized the Lupe. Then it was gone, and he began to slowly think of a plan. "Uhh, yeah. We uhh, found some potion Sinicar was using to uhh, move and uhh, we got rid of it." "That's great Ying!" said the ecstatic green Shoyru. "Where is she?" "Fortuna!" shouted Yang and Destiny. "Oh, um, she said for me to find you and uh� she'd catch us up. Yeah that's it." Destiny frowned. Something here didn't match up. There was something different about Ying. She shook her head. It was probably just her imagination. However, she wasn't the only one to spot the difference. Yang did too, but he was so overjoyed to see his brother again that he pushed the doubt out of his head. "We should get out of here," she said. "Then find Fortuna and go home." 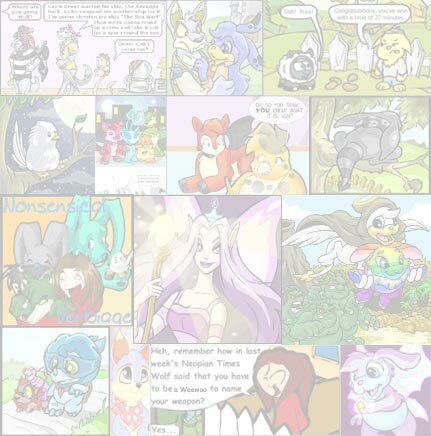 As the crowd of Neopet's, PetPets and owners marched along a corridor, Sinicar brought up the rear. This was going to be easier than he thought. Fortuna slumped on the wheel and sighed. No matter how hard she tried, she couldn't find a way out of this situation. "I can't believe I didn't stop Sinicar," she said to herself. Just then, another voice called out, "Hey, it wasn't your fault." "In the flesh, so to speak" Ying replied. "It's taken me a while, but I think I've got the hang of this whole moving tree thing." "Congratulations. But once this potion runs out it will be a permanent switch. You'd better see if you can contact Yang and get them to stop Sinicar." "Already tried to. Apparently I can only speak in this one chamber. And Sinicar has already joined up with Yang, Destiny and everyone else he's captured, and are heading for the exit." "We have to stop them. Any ideas on how to get out of here?" "Well, I have one. But you're not going to like it," replied Ying. "Ying, if I fall even an inch�" warned Fortuna, clutching the root so tightly she looked like a second skin. Ying's plan was to lift Fortuna off the wooden circle using a root, and lift her up to the platform. However, he wasn't as skilled as using the roots as Sinicar, and Fortuna had nearly fallen five times. And she was beginning to wish she'd just stayed on the circle. Suddenly, the root dropped, splashing on the dark potion, and spraying Fortuna's robes with the goo. As she tried to shake it off however, she found some of it just stuck on the multicolored robe, and seemed to seep into the cloth, glowing slightly. She tried to pick the rest of it off as Ying raised the root back up. "Ying" Fortuna said. "Its times like this I say to myself, why didn't I go into the Slushie business? At least then the only situations I'd get into would be running out of ice!" Usually, Ying would have snapped back a comment, but he was busy. Sinicar made all this movement look easy, but he was having enough trouble keeping control of one root. He hoped it was just that Sinicar had more practice, and not that the potions effects were wearing off. If they were, they were in serious trouble. "Okay�just a little further�yes!" shouted Fortuna, as Ying finally lurched the final few feet to the ledge. As Fortuna pried herself off the vine, Ying used the potion to try and find Sinicar. "What? What is it?" asked Fortuna. "Sinicar, he's" Ying stuttered. "He, Yang and the others have found the exit. They'll be out of here in minutes!" "That means�" Fortuna's eyes widened, and she dashed down the tunnel. "Don't worry Ying, he wont leave this place, even if I have to beat him within an inch of his life." As the Predictor ran out of sight, Ying shouted, "Hey! Don't rough him up too bad, it's my body you're talking about!